By improving your construction management practices, you will see a marked improvement in your bottom line. Often maintaining the competitive edge in your industry requires a lot of work, however it is important to ensure you are doing the right kind of work. This means taking the time to ensure your construction management practices are continually evolving and up to speed with the rest of the industry. In this article, we are going to take a look at how having better construction management practices can help increase your profits, by focusing on better practices, as well as mindset shifts. What construction management practices can I adopt? If you haven’t updated your construction management practices in a while, it is crucial that you take a second look. It is important to update your practices with the times. Even though this may seem like added work, by adopting more efficient practices you will actually make your work life much easier. Construction management and cost estimating software exists for one reason: to make it easier to run your business. By using the right kind of software you’ll be able to communicate more effectively with your team and any other subcontractors you may be working with. One major advantage to using construction management software is the ability to see how the project is progressing. Without utilizing software you’ll have a harder time seeing where every individual piece of the project fits together and if they are actually progressing in unison. Another benefit of using construction management software and tools is the ability to manage inventory. Never again will you have to delay a project and lose money, because the right supplies haven’t been ordered. You’ll always have the inventory at your command, which means you can order supplies when they run low. Even though software may seem like a large investment in the short term, it will definitely improve your business in the long term. Just as you would invest in high quality equipment, such as a portable rebar cutter, you’ll want to make an investment in quality software. The more efficient your business the bigger increase in profits you’ll see. By experimenting with which software works best for your business, you will be able to see what areas of your business are costing you the most money, while being able to streamline others. What kind of mindset shifts will help to increase profits? Aside from simply adopting the use of software and other project management tools, there are other ways you can streamline your processes to increase your profits, too. However, these systems are more related to how information is dispersed across your company, from the top down. An open mind can go a long way. For starters, an open mind will help you adapt and experiment with new technologies before your competitors do, which means your business will often be ahead of the pack. It is also important to keep in mind how changing the processes of one section of your business will influence another. Once new software is being utilized, or new management procedures have been developed and implemented, it is important to make sure that training takes place for any employee who might encounter the new procedures or use the tools in any way. Although there might be an upfront cost in training your employees, incurring these costs will be worth it in the long-run as your company will run very efficiently. Whenever new processes or tools are introduced, it is crucial that you motivate your employees to start using them. People are usually a little resistant to change, but you can make the process easier on them. For instance, you can highlight how it’s going to make their jobs much easier, and can even help your estimators win more bids, as they’ll have more information at their fingertips. 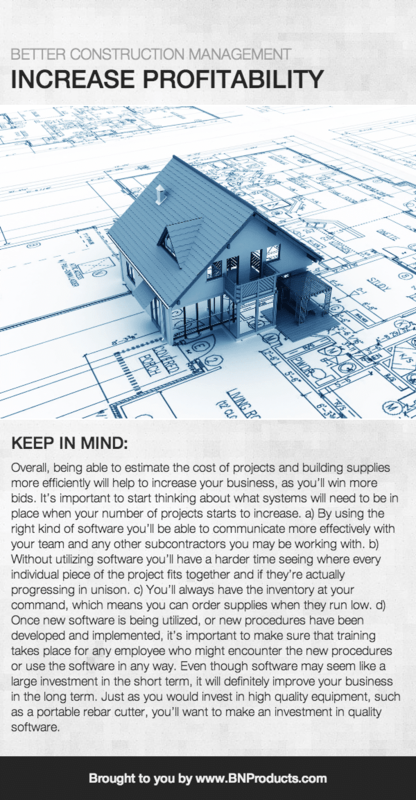 Overall, being able to estimate the cost of projects and building supplies more efficiently will help to increase your business, as you’ll win more bids. It is important to start thinking about what additional systems will need to be put in place when your number of projects starts to increase as a result of this. To find out more about which construction project management tools can help improve your business, read our Project Management and Bidding Guides for more information.